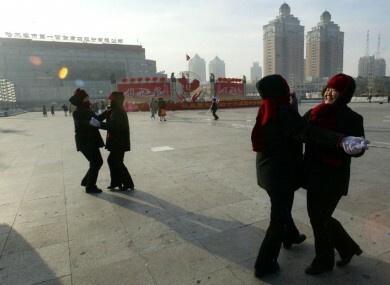 A SPATE OF noisy disputes between middle-aged women and nearby residents has prompted China’s communist leaders to step in and regulate dancing in public places, the country’s state media said earlier this week. Groups of dancers often gather on China’s public squares and street corners performing choreographed routines to loud music, sometimes provoking anger from neighbours. China will step up efforts to manage such dancers, creating a “public square dancing management mechanism” which will be “under government leadership”, the official Xinhua news agency reported. “Public square dancing will enter into the social management system,” Xinhua cited a joint statement from four central departments including the culture ministry and the civil affairs ministry as saying. The agencies will manage dancing in accordance with existing laws, it added. “Dancing in public squares, as a cultural sporting activity deeply loved by the masses… has enriched the spiritual lives of people,” the statement said. But it added: “problems such as inadequate space and… disturbances to local residents by noise and defects in management mechanisms have gradually appeared”. Square dancing has become a hot topic in China, with stories on dancing “damas” – a term referring to middle-aged and elderly women – lighting up state media. But disputes have increased. A man in Beijing who could not bear the loud music played by local dancers was jailed for six months after he fired a gun into the air in protest, the state-run China Daily reported last year. In the central Chinese city of Wuhan, a simmering dispute between enthusiastic “damas” and their irritated neighbours made headlines in 2013 when the residents threw coins, rocks and ultimately faeces at the group in a bid to make them stop. The China Daily said in March that authorities had hired an “expert panel” to choreograph 12 state-approved dances. The government statement won plaudits from users of Sina Weibo, a Chinese equivalent of Twitter. “It is good to ensure that damas will never disturb citizens close to residential areas,” one person said online. “It is definitely necessary to discipline them,” added another. Email “China wants to crack down on middle-aged women dancing in public”. Feedback on “China wants to crack down on middle-aged women dancing in public”.